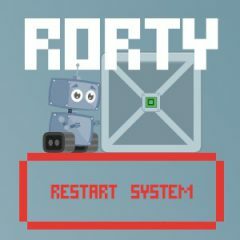 Rorty is a cute robot that wants to find the exit and make sure that all systems work properly. Activate buttons by pulling the boxes on them and reach the door. Rorty is a small but very cute robot that maintains peace and proper work of the station. He wants to make sure that everything works fine, so he has to reach every room at the station and check it for malfunctions. However, he will face some obstacles on his way and in order to reach to the other level, he will have to ask help from the tiny flying robot.